You never realize it when you create it normally. You start with the fundamentals. You take things one day at a time. You live in the moment. You seize the day. And then someone points out to you, or you realize after looking at a calendar that you have actually started a “streak.” Some of you out there have streaks that you’re not even aware of continuing, but like a statistician there are people keeping track. Good or bad, you won’t know it until you look over your shoulder and there it is… Your streak. 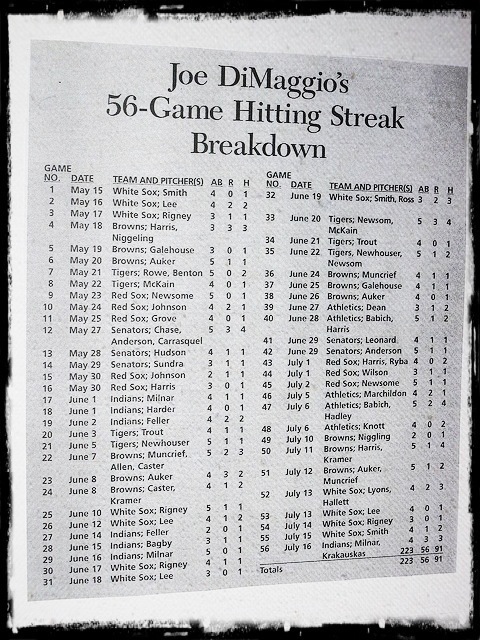 I wonder if Joe DiMaggio knew on this day back in 1941 that the 9 game hitting streak he had going would blossom into “THE STREAK” of 56 consecutive games with a hit that still stands to this day. Whatever your streak situation may be, remember the best way to start it, or keep it going, is to show up.